Sport to trash to sustainable fashion: LifeCycle Bracelets come full circle. A young artist's quest for a diamond in the rough. 98 backers pledged $11,542 to help bring this project to life. The average bike shop produces 25-40 pounds of wasted chain PER MONTH! 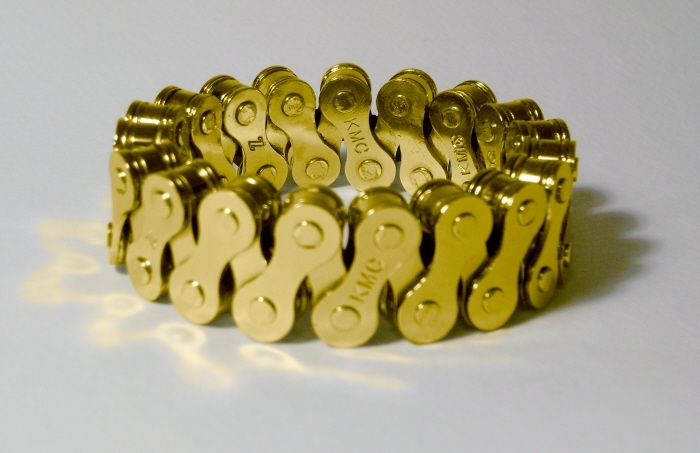 LifeCycle bracelets are made entirely from bicycle chain that would otherwise be thrown away. It costs bike shops money to ship the heavy waste chain to be melted back down for recycling. I would like to set up a network with bike shops across the country to have this material shipped to me (at my expense) so that I can repurpose it into unique, fashionable bracelets and send them to my supporters. Upon the funding of this project, the money will go towards paying to ship materials, building better forging tools, and electroplating bracelets. I have received so much encouragement about my costumes, that I thought I would offer some of them in support of LifeCycle bracelets. All of the pieces below are one-of-a-kind, and all are entirely hand-made from reclaimed materials including bicycle inner tubes, chains, and other machine parts. They are fastened together with thousands of nylon zip ties! Long trenchcoat. This unique piece weighs roughly ten pounds and utilizes approximately 2500 UV reactive blue nylon wire ties. The photo below was shot by eyeballimaging.com on the twilight shore of Portland, ME. Premium LifeCycle Bumper Sticker --- Help us out with a donation, and by spreading the word with a 3" LifeCycle bumper sticker. They also look great on bikes! 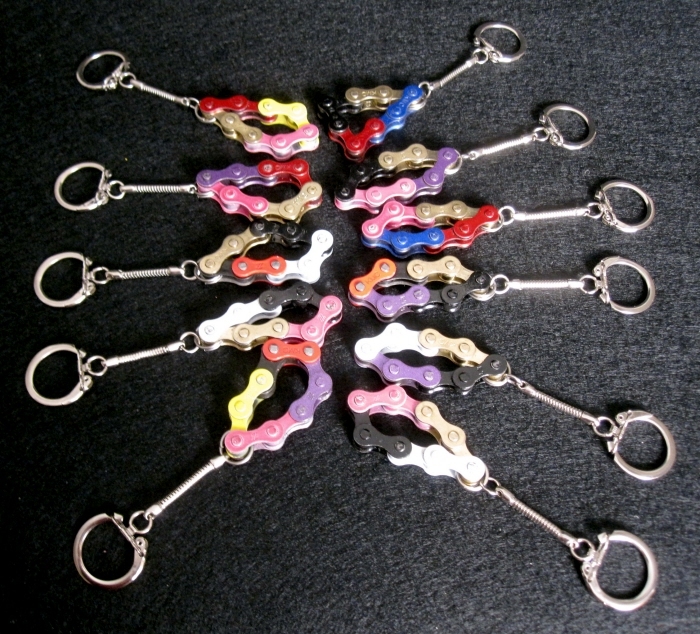 LifeCycle Keychain --- Made from reclaimed links of bike chain. Backers will receive one hand-made keychain and a premium bumper sticker for their car or bicycle with the LifeCycle bracelet logo. 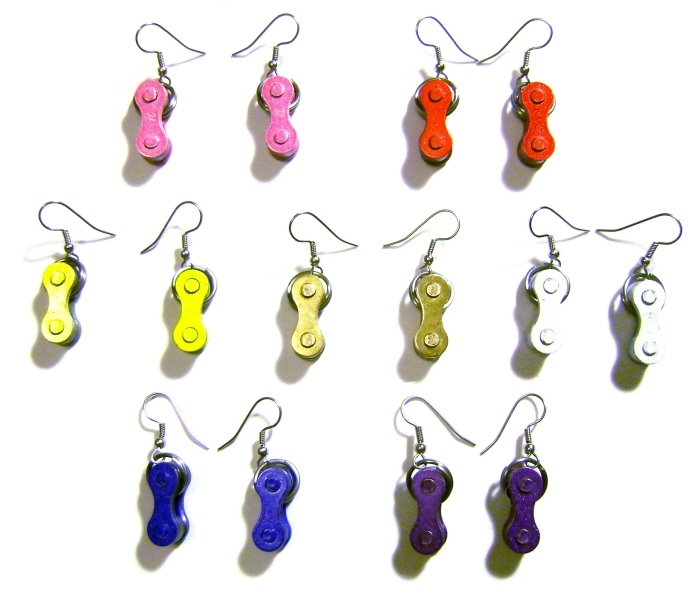 Earrings --- Choose from a variety of colored earrings in white, black, yellow, red, purple, pink, blue, green, or gold. Your color preference will be surveyed before they are shipped. Backers will also receive a premium bumper sticker for their car or bicycle with the LifeCycle bracelet logo. Backers will receive a colorful powder-coated LifeCycle bracelet (random color due to availability) and a premium bumper sticker for their car or bicycle with the LifeCycle bracelet logo. Powder-coated LifeCycle Bracelet --- Backers will receive a colorful powder-coated LifeCycle bracelet (color choice will be surveyed upon project funding. Colors include black, white, yellow, green, blue, purple, red, and pink) and a premium bumper sticker for their car or bicycle with the LifeCycle bracelet logo. Backers will receive a stainless steel LifeCycle bracelet and a premium bumper sticker for their car or bicycle with the LifeCycle bracelet logo. Rainbow Powder-coated LifeCycle Bracelet --- Backers will receive a Rainbow Powder-coated LifeCycle bracelet (random assortment of colors) and a premium bumper sticker for their car or bicycle with the LifeCycle bracelet logo. Backers will receive a chrome-plated LifeCycle bracelet and a premium bumper sticker for their car or bicycle with the LifeCycle bracelet logo. Backers will receive a silver-plated LifeCycle bracelet and a premium bumper sticker for their car or bicycle with the LifeCycle bracelet logo. Backers will receive a 10K gold-plated LifeCycle bracelet and a premium bumper sticker for their car or bicycle with the LifeCycle bracelet logo. Red and Gray Bug-Eyed Mask --- This mask is made up of inner tubes that have been sliced into rings, then stitched together with a combination of red and gray nylon zip ties. The protruding eyes feature stainless steel welding rings, and the hanging proboscis is made from plumbing parts. Blue Welded Oculus Mask --- I welded the framework for this mask from reclaimed stainless steel. The left eye is shrouded by a sheet of inner tube rubber, while the left eye peers through a welded framework. The piece is hand-stitched together with approximately 350 UV reactive blue nylon zip ties. Long trenchcoat --- This unique piece weighs roughly ten pounds and utilizes approximately 2500 UV reactive blue nylon wire ties. The photo below was shot by eyeballimaging.com on the twilight shore of Portland, ME.